Sigma 18-35mm F1.8 DC HSM A Canon mount lens review: fixed focal length quality in a zoom? As with the 35mm prime, this new model is one of the firm’s new Art series lenses challenging Canon’s L-series and the similar ED lenses from Nikon for optical quality. At first blush it could be mistaken for a full-frame lens but it is in fact designed for APS-C format DSLRs and has the equivalent angle of view of a 29-56mm zoom on a Canon EOS 700D or similar body. It stands out for its constant f/1.8 maximum aperture, which is the fastest zoom made for DSLRs currently (that accolade previously went to Olympus for their phenomenal Zuiko Digital ED 14-35mm and 35-100mm f/2.0 zooms), and features no less than 17 elements in 12 groups. Of those, five are low dispersion glass types and four elements feature aspherical surfaces. In all, the lens weighs a fairly significant 810g (28.6 oz.) but it has an ultrasonic type AF motor, focuses to 28cm and has a sticker price of a not unreasonable $799. With a DxOMark score of 25 points, the lens is a superb performer optically. Ultra-fast lenses don’t usually perform well at full-aperture, let alone high-speed zooms that before this lens arrived usually meant a maximum aperture of f/2.8, but this one bucks that trend. At 18mm full-aperture sharpness is excellent from corner to corner, though sharpness in the outer field drops slightly through the zoom range to 35mm. For most focal lengths and apertures, though the sharpness differs by 5% or less across the frame. Distortion, lateral chromatic aberration, even vignetting which appears softly gradated, are all very well corrected for a lens like this. At 1.8TStops, transmission is excellent – this really is an f/1.8 lens and will likely appeal to filmmakers as much as still photographers. With the introduction of this model, Sigma has the best performing zoom of its type. 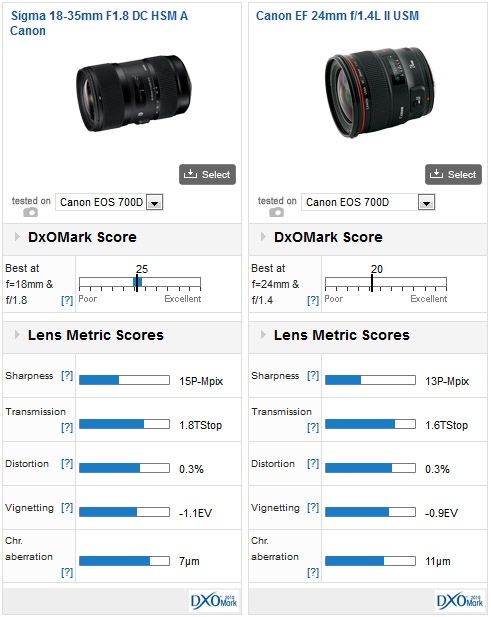 The DxOMark score of 25 points puts well ahead of both the full-frame Canon EF 24-70mm f/2.8 L II USM and the Tamron SP 24-70mm f/2.8 Di VC USD (though bear in mind those lenses become the equivalent to a 38-112mm on a Canon APS-C body). 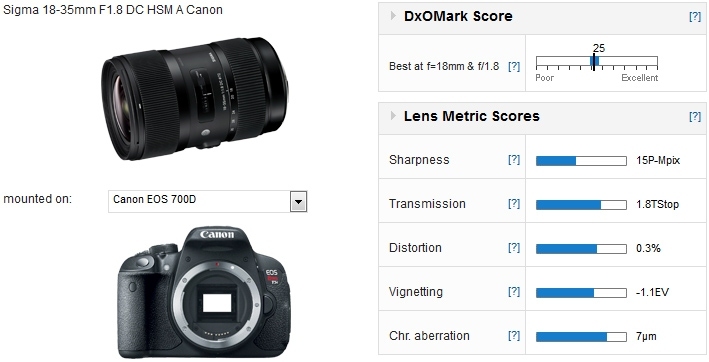 As for sharpness, the new lens is on a par with the very best performers, matching the $1699 full-frame Tamron SP70-200mm f/2.8 Di VC USD and the firm’s $999 APS-C format 50-150mm (80-240mm equivalent) f/2.8 EX DC APO HSM model with a 15P-Mpix score on the Canon EOS 700D. 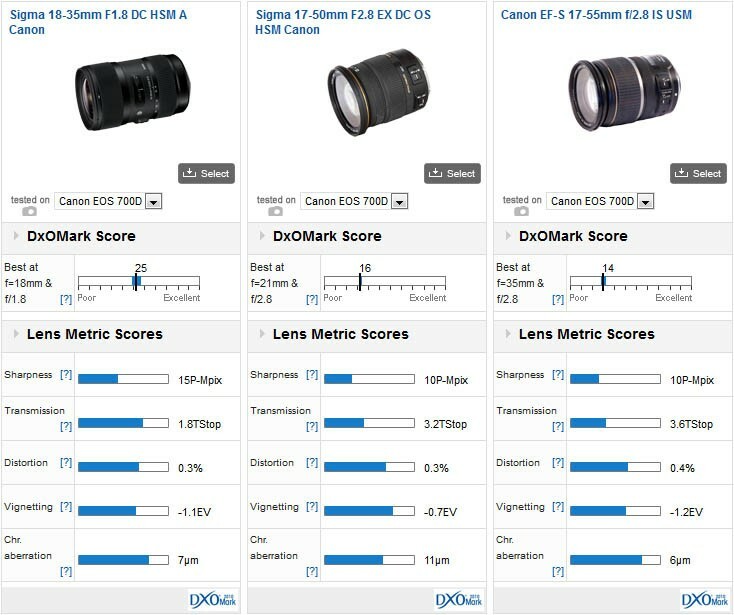 Comparing the new Sigma to the firm’s nearest equivalent model, the $670 Sigma 17-50mm f/2.8 EX DC OS HSM and Canon’s $1,180 EF-S 17-55mm f/2.8 IS USM,the high DxOMark Score is appreciably higher, as we’ve seen from the rankings above. 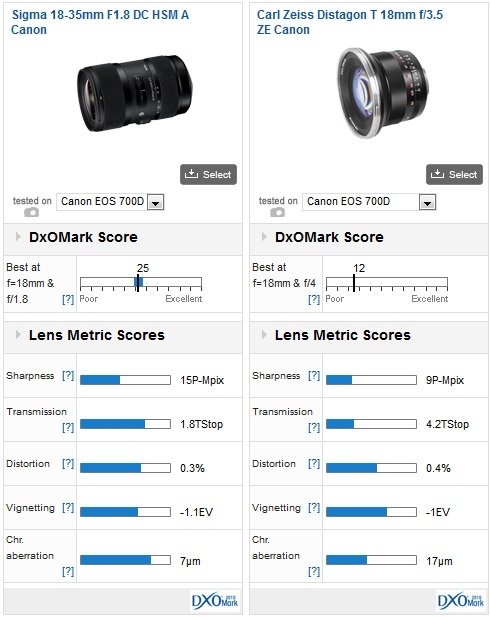 While both models have stabilization optics, individual metrics show the new Sigma is significantly sharper than either, has far better transmission (actually +1.66 stop faster than the older Sigma and +2 stops faster the Canon) and has comparable distortion, reasonably low vignetting and very low chromatic aberration. Are high quality prime lenses still necessary? In this set of evaluations, we’ve compared the Sigma zoom with the highest performing full-frame primes of the same focal lengths – 18mm, 24mm and 35mm. While it might seem a little unusual, the lenses (all high speed models) reflect the state of the art in that format and when mounted on an APS-C DSLR offer the same angle of view (at each focal length) as the Sigma. At a $1,395, the Carl Zeiss Distagon T* 18mm f/3.5 ZE is one of the finest quality wide-angle primes money can buy, but as a full frame lens it has been designed to illuminate a larger image circle and so requires larger diameter elements and a more complex lens design. As a result, the Sharpness score is good for an ultra-wide 18mm on a full-frame camera but it’s not so great as the equivalent to a 29mm on the Canon EOS 700D. That is one of the advantages of designing lenses for smaller formats. Despite the relatively high imaging performance of the Zeiss, some chromatic aberration is noticeable in the corners of the frame though distortion and vignetting are at similar levels. Be that as it may, as our results show, at 18mm the new Sigma lens is much more suited to the APS-C format than the Zeiss. Our second comparison is against the full-frame $1,750 Canon EF 24mm f/1.4L II USM, the highest performing 24mm currently available. Again, the same principles apply here as they did for the 18mm Zeiss, but the new Sigma is more than capable of holding its own at 24mm where both lenses would have the equivalent angle of view of a 38mm (in 35mm terms) on the EOS 700D). Apart from a slight increase in sharpness, the Sigma can even boast lower levels of chromatic aberration. Our final comparison, ironically, has the new Sigma up against the firm’s new 35mm f/1.4 DG HSM A, the best performing full-frame 35mm lens in our database. Although it’s easier to make a high-speed 35mm than either a 24mm f/1.4 or a 18mm f/3.5, the Sigma 35mm is without doubt a superb performer optically and yet the new Sigma 18-35mm zoom comfortably achieves a higher DxOMark Score. The new zoom also has slightly higher levels of sharpness and has the edge in uniformity. 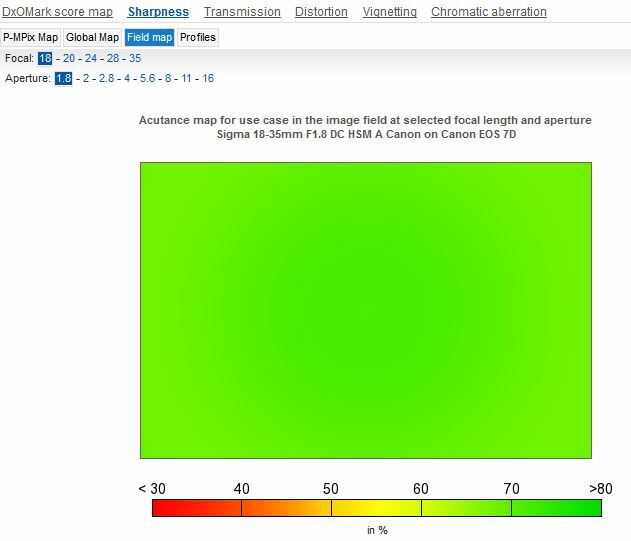 Less important perhaps is the superior transmission score, while the differences between distortion, vignetting and chromatic aberration are practically negligible. 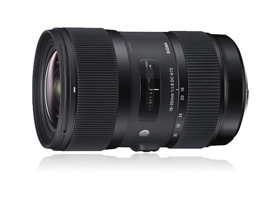 Although it is unlikely a user would buy several full-frame wide-angle lenses specifically for an APS-C format camera, the fact remains that the Sigma 18-35mm f/1.8 DC HSM is an outstanding performer optically. If we want to be picky, the Sigma lacks image stabilization and the zoom range isn’t as wide as some rivals, but at $799 the lens is remarkable. Like the Nikon AF-S Nikkor 14-24mm f/2.8G ED before it, the Sigma is likely to be viewed as a disruptive innovation and genuinely means we no longer have to choose between the flexibility of a zoom over the imaging characteristics that were once only available with a prime.